Across the globe, the Association's members are represented in 125 chapters, 15 councils in 60 countries. The Northern Ohio chapter spans as far south as Akron & Canton. IFMA is the largest and most widely recognized professional association for facility management. Across the globe, the Association’s 24,000 members are represented in more than 100 countries. 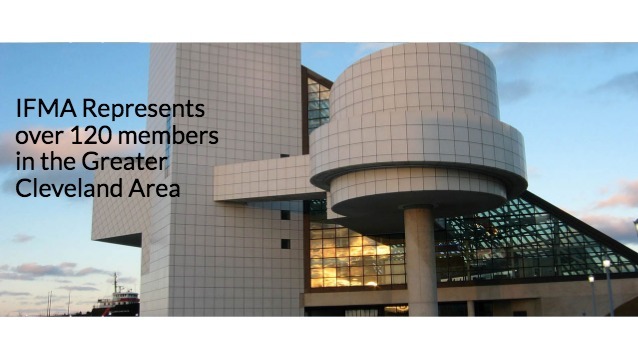 Locally, the Northern Ohio IFMA Chapter represents 80+ members in the greater Cleveland, Akron and Medina areas. Members represent a variety of organizations and corporations, including Allstate Insurance, the Center for Health Affairs, the Cleveland Foundation, Jones Day, Progressive Insurance Co., Sherwin Williams. The Chapter also regularly hosts facility tours, professional development events, and networking opportunities throughout the year. Locations vary throughout Northern Ohio, to ensure all members have a convenient opportunity to participate and be engaged. Previous tours have included Progressive Field, the Cleveland Playhouse, Allied Technologies, Parker Hannifin’s corporate headquarters, and Saint Martin de Porres High School. Learn more about IFMA or join today!